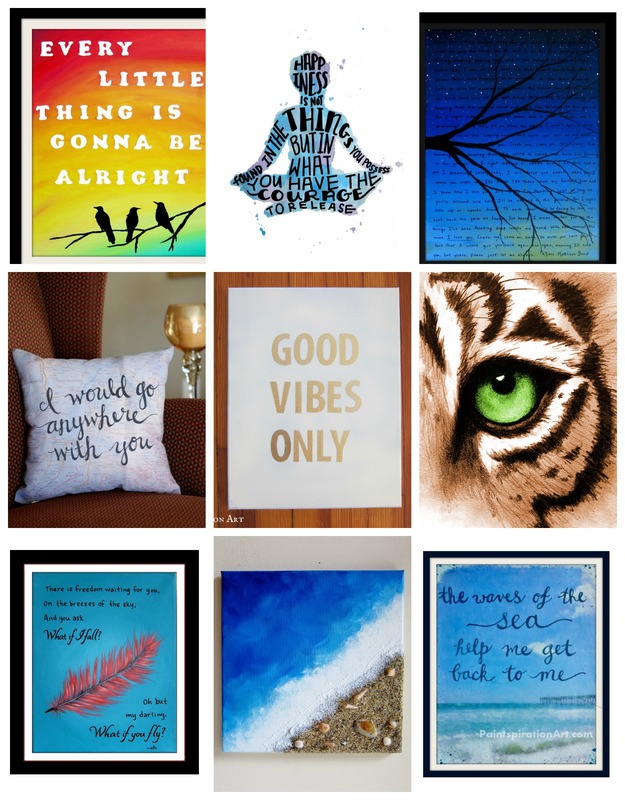 Canvases with inspirational quotes are really popular right now. I would know, since they’re my main product I sell on Etsy! Not everyone is blessed with fabulous handwriting and a steady hand. But fear not- I’ve found solutions! After making dozens of quote canvas paintings, I’ve experimented and tweaked different methods for transferring writing onto canvas. 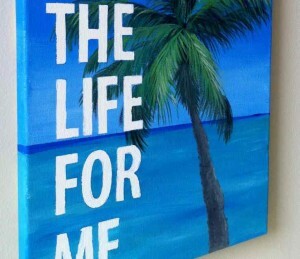 Here’s my top 3 methods for writing on canvas and making a beautiful, personalized piece of art! For each of these methods, you’ll need to start with a canvas. I recommend finding a canvas that is stapled on the back and the not sides, like this one on Amazon. You’ll also need at least two contrasting colors of paint. I use acrylic paint for this project because of its quick dry time. You can also use spray paint if you don’t want the hassle and mess of painting by hand. I like Krylon brand spray paint, like this one. Finally, I recommend finishing your artwork with a spray to seal and protect it. I use this Krylon Matte Finish Spray; this brand also comes in glossy and satin finishes. Using vinyl letter stickers is arguably the quickest and easiest way to transfer letters onto canvas. Make sure your letter stickers are vinyl and do not say “permanent.” I use vinyl letter stickers like these. Paint your canvas the color you would like your letters. Let it dry. Place your letter stickers on the canvas. Use your ruler to measure the distance between letters and make sure writing is even and straight. Paint your background color over top of the stickers (be careful- if you paint too rough, your letters will move). Be sure not to layer the paint too thick, or it will lift off when you pull off your stickers. Let your canvas mostly dry. Peel stickers off while you’re canvas is still slightly tacky. You can use a pair of tweezers if you’re having trouble removing the stickers. You may need to clean up the edges of your letters with a small paint brush. 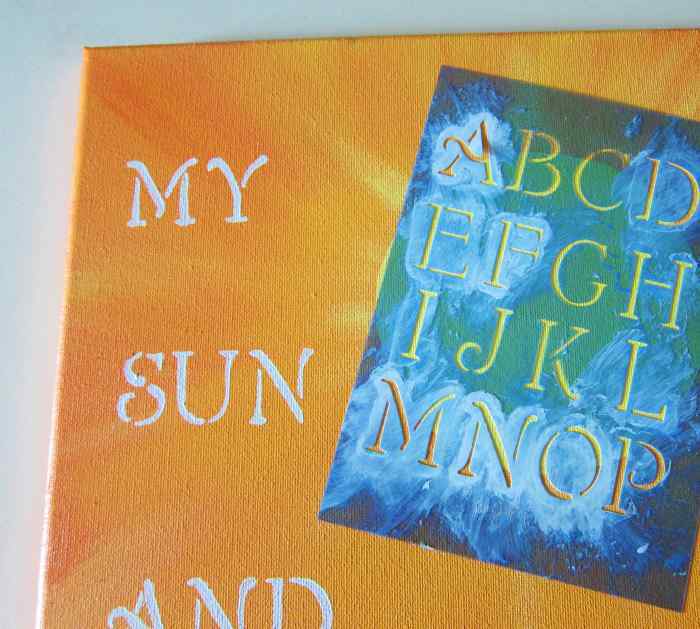 Stencils are a great method if you are planning on painting a more complicated background because you can easily paint the letters over your background. Cons: Can be really time consuming! Paint your canvas in the color background of your choice. Let dry. Measure where you want each line of your writing. 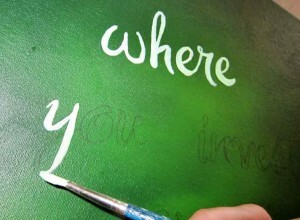 Place your stencil down and carefully paint over the letter. Make sure your paint is not watery. Lift straight up. Clean the edges of the letter with a clean, slightly wet brush. The brush should lift any excess paint that leaked around the edge of the stencil off the canvas. With the paper towel, wipe excess paint off your stencil. Let the paint dry completely. Once the letter dries, you can move on to the next letter. This is my current favorite method of writing on canvases! Pros: Get neat, clean lines and it’s quicker than stencilling. Cons: You’ll need a steady hand to use this method. Also, the carbon can smudge on the canvas and get a little messy. Paint your canvas the background color of your choice. Let dry. On your computer, find a font that you like (If can’t find one, google has loads of great fonts you can download for free at http://www.google.com/fonts/).Type out your quote. Determine how large you want each letter or word to be and readjust your font. Print your quote. Arrange your quote on your canvas. You may need to cut the words out and readjust them depending on how big your canvas is. Place carbon paper face down underneath each word. Tape the paper and carbon paper in place. Trace over the letters with your ball point pen. Don’t press too hard or you’ll dent your canvas. Carefully remove the tape and papers. With your small paint brush, paint within the lines in the contrasting color. Let dry. If you’re using a light color on a dark background, you may need 2 coats. Erase any pencil marks that are left over. After you complete your project, I recommend you coat your canvas with the finishing spray to protect it. Again, I use this Krylon Matte Finish Spray; this brand also comes in glossy and satin finishes. And that’s it- you’re all finished! Now you have a beautiful piece of personalized art. You can frame your canvas, or just hang it right on the wall, like I do. Tell me, which methods have you tried? What are the pros and cons you’ve encountered? Is there an easier way you’ve made the same project? I’d love to hear from you! I absolutely adore your work. I checked out your Etsy site and it inspired, made me laugh and smile!!!! 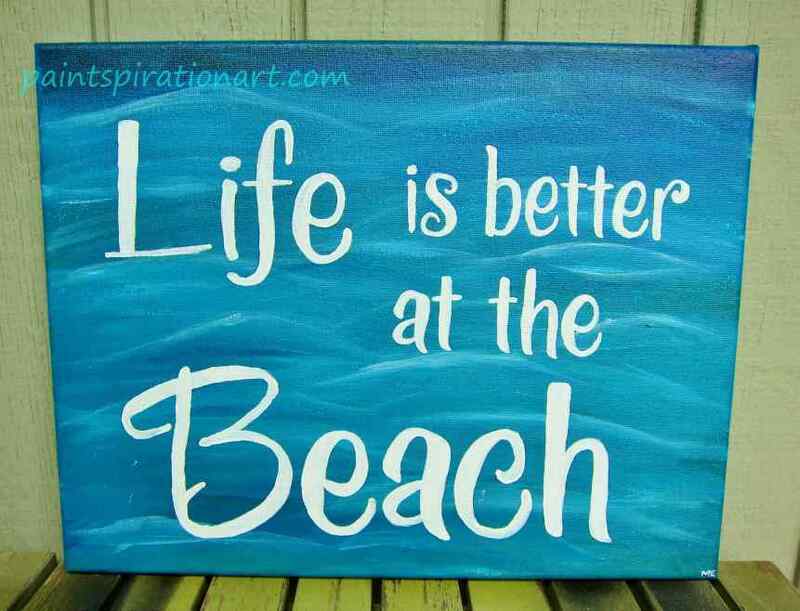 Can I paint the canvas with Annie Sloan chalk paint and then use vinyl lettering? Does the carbon paper work even on a black background? Hi Karin, Yes the carbon paper will work on a black background, but it can be a little tough to see. Good lighting really helps! Good luck! Great idea! What type of color do you use? One method I have found that works really well is using a stencil and the light modeling paste. Place stencil on finished canvas, use spatula and apply paste, then paint on top of paste while stencil is still in place. You could also mix paste and paint prior of course. Just try to see what works best for you. Letters come out crisp even with very ornate cursive script and small fonts. I am doing an art party for my 3 year old. My “plan” is to put the vinyl letter on the white canvas (after painting the little square area where I will put the letter white so that it sticks). Then I want to paint over the letter and whole canvas with a light blue color and the kids will do firework art on top with toilet paper rolls and paint. My issue is that I want to do the painting and letter ahead of time cause I am dealing with 12 kids. If I do this like 5 days in advance, when I take the letter off will it peel the paint and make a mess? I want to make sure that their initial comes out perfect… I know that acrylic paint can sometimes stretch. Is this process meant to be done while the paint is still a little wet only?